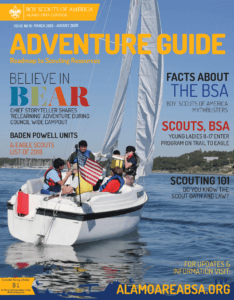 The purpose of the Boy Scouts of America–incorporated on February 8, 1910, and chartered by Congress in 1916–is to provide an educational program for boys and young adults to build character, to train in the responsibilities of participating citizenship, and to develop personal fitness. To join Scouting, contact your local unit or email Join@AlamoAreaBSA.org or call 210-341-8611 and ask for the membership department (Field Service Office) to be put in contact with the Recruitment Specialist (SSE) who organizes Scouts in your area. There are also Unit pages available in a list from each of our Council’s district pages. Volunteer adult leaders serve at all levels of Scouting in approximately 280 local councils, 30 areas, and 4 regions, and nationally with volunteer executive boards and committees providing guidance. Each autonomous local council is chartered by the BSA, which provides program and training aids along the guidelines established by the national Executive Board and the national charter from Congress.